Everyone can open a can of soup but there is something about homemade stock that elevates your game, and if you’re delivering this to a sick friend or relative, you score big for your efforts 🙂 I know there are a million recipes out there – this is one I like. It’s a variation on chicken noodle, and the lemon and ginger add extra healing power. Bring all ingredients to a boil in an 8 to 10-quart / 4 L heavy pot. Skim froth. Reduce heat and gently simmer, uncovered, skimming froth occasionally, 3 hours. Pour stock through a fine-mesh sieve into a large bowl and discard solids. If using stock right away, skim off and discard any fat. If not, cool stock completely, uncovered, before skimming fat, then chill, covered. Stock can be frozen for future use. Heat oil in a large heavy pot over medium heat. Add leek, celery and ginger; stir. Add chicken and sauté till brown, approximately 5-8 minutes; season with salt and pepper and thyme. 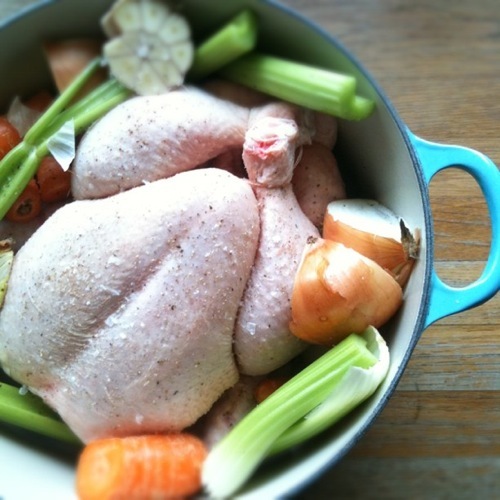 Add stock and bring to a boil, cover, reduce heat, and simmer until chicken is cooked through, 15-20 minutes. Transfer chicken to a plate. Let cool, then shred chicken into bite-size pieces. Meanwhile, return broth to a boil. Add orzo and cook until al dente, 8-10 minutes. Remove pot from heat. Stir in chicken and lemon zest. Squeeze lemon juice into pot to taste – try one half first and stir, then add the juice from the other half lemon if desired. Adjust salt and pepper and serve.